A few months ago, I was introduced to an entrepreneur named Suman Kanuganti. Suman is the leader of a passionate team of technologists responsible for creating Aira, a new service for blind and visually impaired (BVI) people. 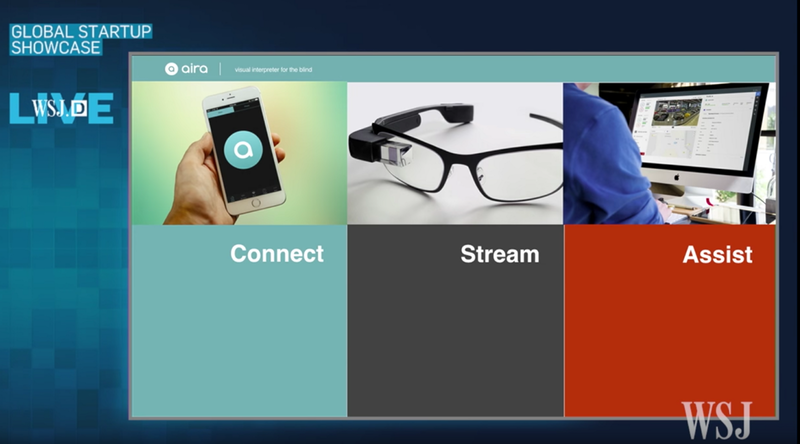 The service allows a user to quickly connect with a remote human agent via the Aira app. The intended goal is typically to accomplish a task that would benefit from some sighted assistance such as grocery shopping, finding the end of the line in a Starbucks or a variety of other daily tasks. 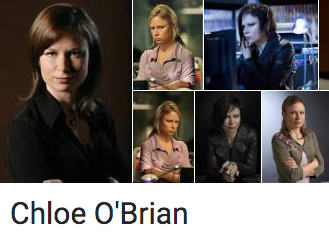 The Aira agent is a hybrid of human and Siri-like artificial intelligence is akin to Chloe O’Brian from the television series 24 starring Kiefer Sutherland. Hero Jack Bauer would call his on his trusted resource Chloe whenever he was in need. In our first conversation, Suman told me that his company is on a mission to to make information immediately available to all. While I appreciated his ambitious goal, I was honestly skeptical because the BVI community has not traditionally been a target for innovation. Despite its loyal user base and 300+ million market size, only a few innovations such as the Seeing Eye Dog (1892), White Cane (1921), and Kurzweil reader (1969) had widespread impact with this community. The visually impaired user opens the app or presses a button on their glasses, which calls one of the trained Aira agents. With the help of a special dashboard, an agent can see the users’ surroundings either through smart glasses or a phone camera. The agent can then verbally walk the user through what’s around them and answer questions. Aira’s doing something that wasn’t possible just a few years ago. They’ve built a high-tech enabled service business that leverages the convergence of technology trends like wearable, widespread bandwidth and human-assisted AI to power an intelligent Aira platform. It’s an API for the blind that enables greater mobility and independence. One user said it was “freedom” as she no longer had to send a courier or store associate to get her bananas; she can now pick herself the ripest bunch. To date, Aira has raised 3.3 million in venture funding from Lux Capital, Arch Venture Partners and Felicis Ventures. The company is currently raising their Series B and has established partnerships with leading organizations of and for the blind. It’s also an assembled an impressive rosters of technologists, scientists and customer advisors. 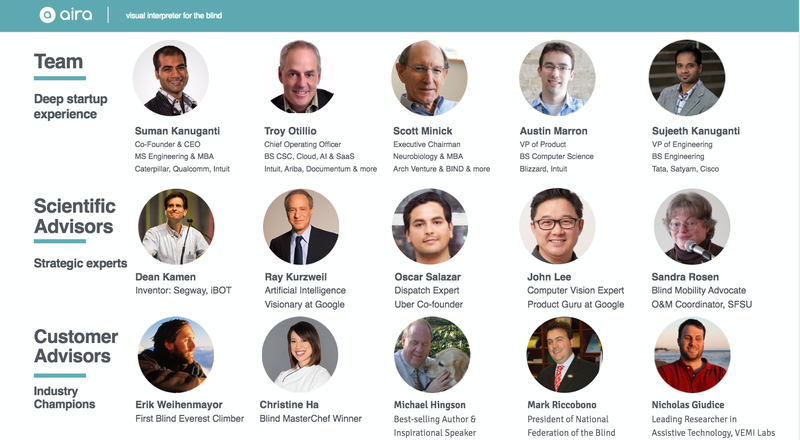 Why did these highly sought after people join Aira? Earlier this month, I went with Suman to NYC to meet with Mark Riccobono, President of the National Federation of the Blind (NFB) and member of Aira’s Advisory Board. Diagnosed with glaucoma and aniridia at age five, Mark is your classic thoughtful CEO and leads the oldest and largest organization of blind people in the United States. After a day of business meetings in the city, we decided to be proper tourists and visit Rockefeller Center to experience the famed holiday attractions before grabbing dinner. In case you missed it in the video, Mark is wearing smartglasses that are streaming video to a remote Aira agent. 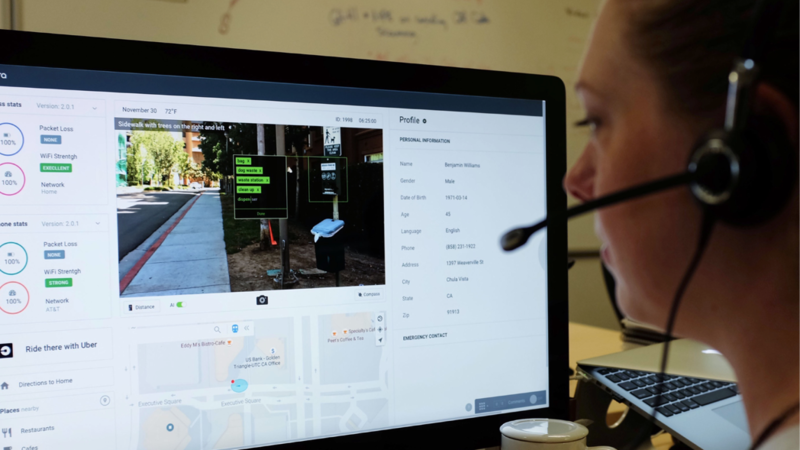 The agent has an AI-powered dashboard that helps them verbally walk the user through their surroundings and answer questions. Mark was our tour guide for the night. He led us to the tree and located a prime corner spot to enjoy the musical light show. He then asked us for food preferences for our meal and selected a restaurant. It was impressive to watch him choose a restaurant that was several blocks away and navigate our party through the NYC crowded streets without incident. When discussing the Rockefeller Center experience at dinner, Mark commented on several details that Suman & I both missed such as a missing star from the top of the tree. I already mentioned the 100+ items on the dinner menu but didn’t share how Mark (and his Aira agent) quickly digested the menu. Traditionally, most menus are not in braille so the BVI customer has to rely on other ways to navigate a menu. This time, Mark had the agent reviewing the menu in real-time and using the AI dashboard to scour Yelp and source recommendations. My foodie friends would consider this as his recommendations to the table for signature dishes were spot on. If you want to learn more about Aira or know someone who could benefit from the service, visit aira.io.